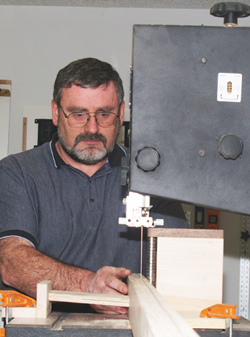 As a supplier of portable, resaw, and timber band saws and blades, the most common complaint we hear from new customers is that they’re breaking blades way too often. Sometimes they blame it on a bad welding job, but usually the truth is that the blade just isn't running straight and undeflected through the saw. Once they understand the physics involved, the breakage problem disappears and new blades work just fine. It’s hard to explain verbally, so maybe the four drawings below will help. They graphically describe the overwhelming stress that band saw blades are subjected to every day. Conventional wisdom is that 3-wheeled band saws break blades because they have to go around too many small wheels, instead of two big wheels. To some extent that might be true, but the degree of stress a blade experiences going around a 5" radius isn’t nearly as severe as that which it goes through when bent around a blade guide roller with just a 1/2" radius. It doesn’t have to stay at that angle very long to be bent out of shape. And once bent, it’s bent for life. 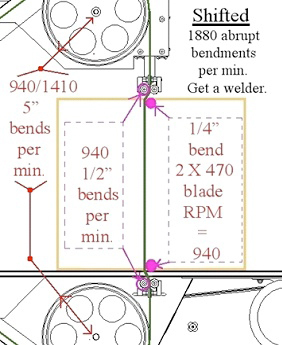 If you take two pair of pliers and work a blade weld from 5" on either side, it will take a long time and a lot of bending before the weld will fail. But move those pliers in close and you can break a weld in seconds. The same rule of physics applies when the blade spins around the saw at 72'/sec. That’s 470 blade revolutions per minute on a Falberg saw. 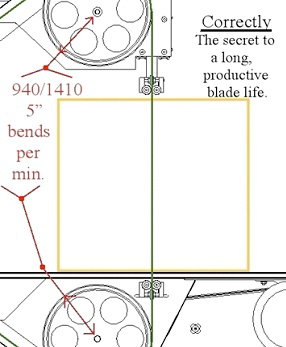 It takes a long time to over-work a blade around 5" radii; but not long at all when the bend radius is less than 1" - especially under high tension. contact with a roller you should immediately correct the direction of feed by shifting the saw (or kerf) back to center. This phenomenon becomes even more critical for those using guide blocks, as the bend radius can be very acute, especially under high tension. (Quite often, people have over-tensioned a narrow kerf blade).This may sound totally alien to those of you who believe blade guides should always rub against the flat of the blade to keep it running straight. That impression is, well, wrong. The urethane tires actually keep the blade running straight; the guides are there to turn the blade for contour cuts. Another common cause of weld failure is almost impossible to see from the operator’s viewpoint and involves your choice of blades. 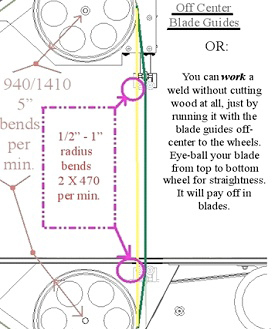 If the blade gets deflected by internal knots or drifts away from a cross grain (insufficient set angle), it will emerge out the bottom of your workpiece off-center to the lower blade guide... and abruptly bends to fit back in. It then wraps around another 1/2" radius roller (even tighter if you’re using blocks), to return to the lower wheel. Talk about working a weld! The only cure for this is to start over with a better blade and try again. 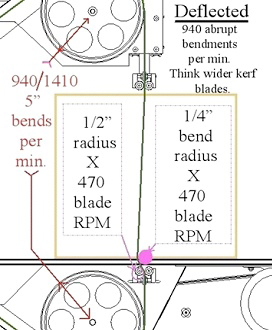 The following drawings are based on a 110" blade traveling at 72'/sec. on a 3-wheeled band saw with 10" wheels. The lower of the 5" radius RPM counts applies to two-wheelers, but do not change the abrupt (1/4" and 1/2" radii) bend counts.